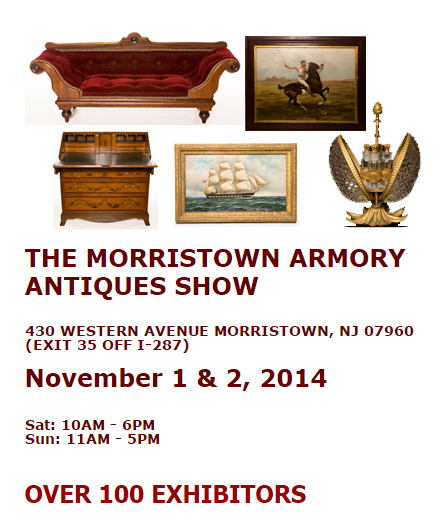 The Morristown Armory Antiques Show will open this Saturday, November 1st, at 10 AM and close on Sunday, November 2nd, at 5 PM. The Morristown Armory is a nice facility, just outside of town, with plenty of parking. Setup is easy with vehicles allowed to drive right up to their booths. It’s a quick show, with immediate results — either you did well or not. The quality of the show is usually quite good, so it’s worth a trip from anywhere in the greater NY, NJ, CT, or PA area. 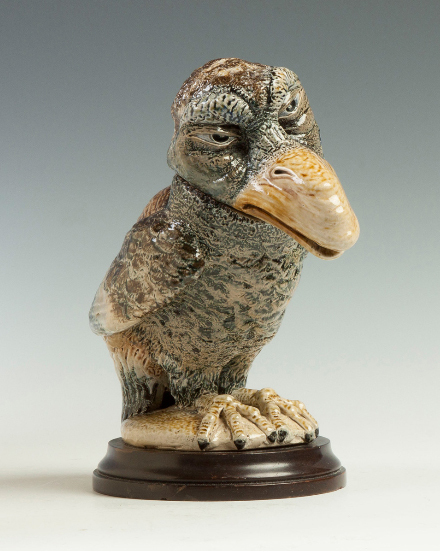 We’ll be bringing some outstanding new objects that we’ve just recently acquired, including a fabulous Martin Brothers bird — the first one in a long time. 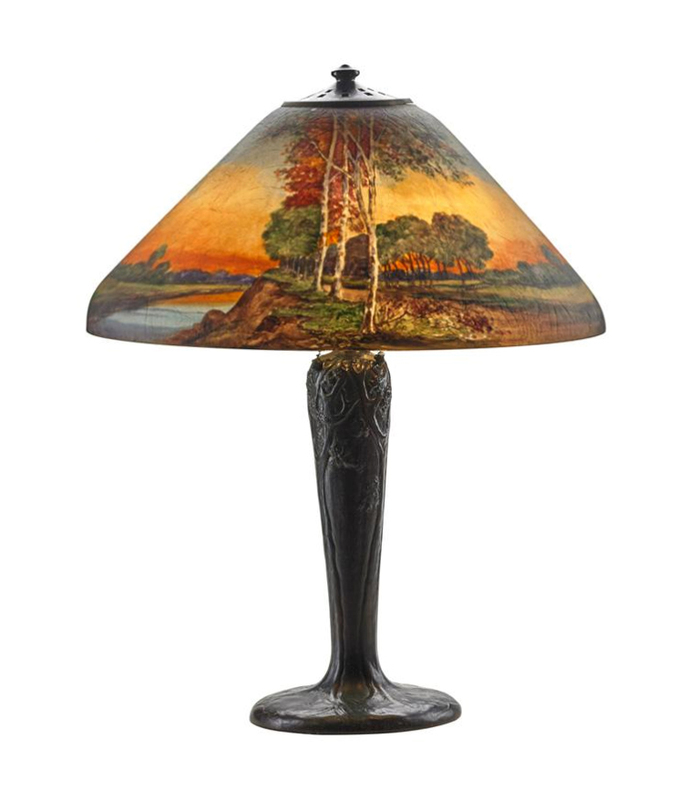 Additionally, we’ll have new Tiffany Studios lamps, including two fine Linenfold examples, a wonderful 18″ Handel scenic lamp, a Daum Nancy scenic blownout vase, an Amphora portrait vase, English cameo vases, and numerous other items. It will be one of the best displays we’ve ever done. 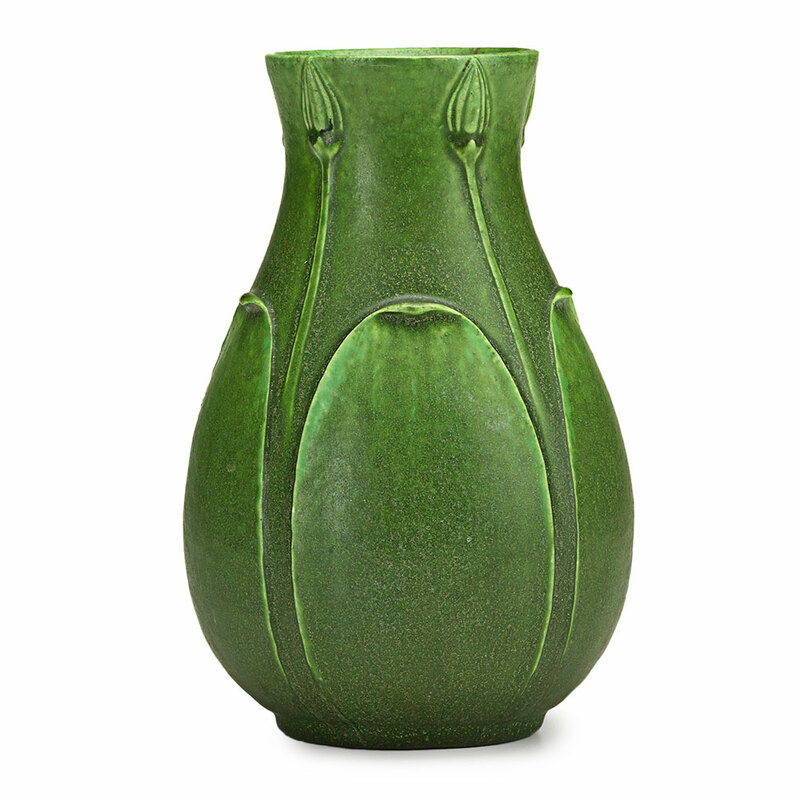 Our next show, of four in a row, will be the Antiques + Modernism Winnetka show, in a suburb of Chicago. That will be followed by the Kansas City Antiques Expo, and then our final show of 2014, back at the Pier in NYC for the usual November show. Remember to check my website for the latest items and keep reading my blog. Tune in Monday for the results of the Morristown Armory Antiques Show. Heritage Auctions held its Illustration Art Signature Auction on October 17-18, 2014. 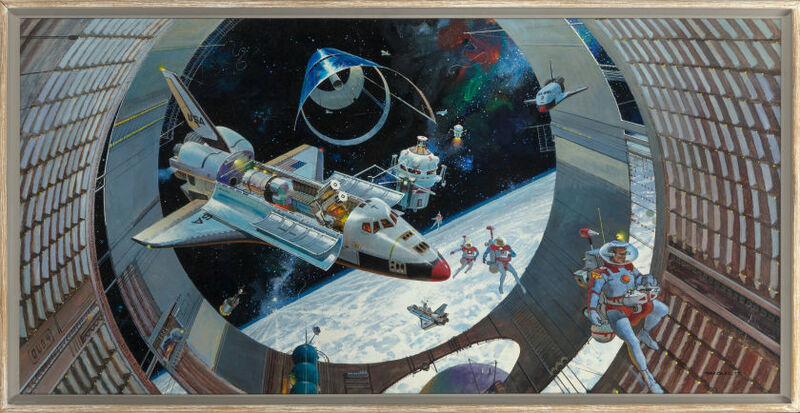 Included in the sale was original art from the Norman Jacobs Starlog collection — a monthly science fiction magazine — which met with an enthusiastic response. Usually the works of Gil Elvgren top the auction, but this time it was science fiction. The result for the second best lot, #72004, was a big surprise. Chesley Bonestell’s Beginning of the World (The Earth is Born), a mixed media on board painting, flew past its pre-sale estimate of $15,000 – $25,000, to realize a stunning $197,000. The painting had been used for the December 8, 1952 cover of LIFE Magazine, which no doubt added to the enthusiasm. 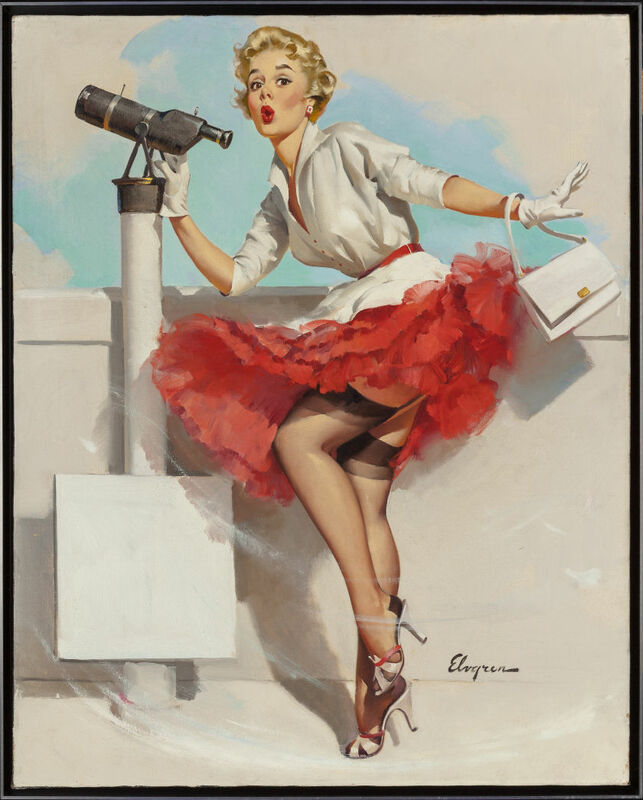 12 examples of Gil Elvgren’s art were sold in the sale, with lot #72113 leading the way. The 1957 painting, entitled What a View!, was used as a calendar illustration for Brown & Bigelow. It sold for $68,750, against a pre-sale estimate of $40,000 – $60,000. For the complete results of the sale, click here. You will be required to sign in (free) to see the results. 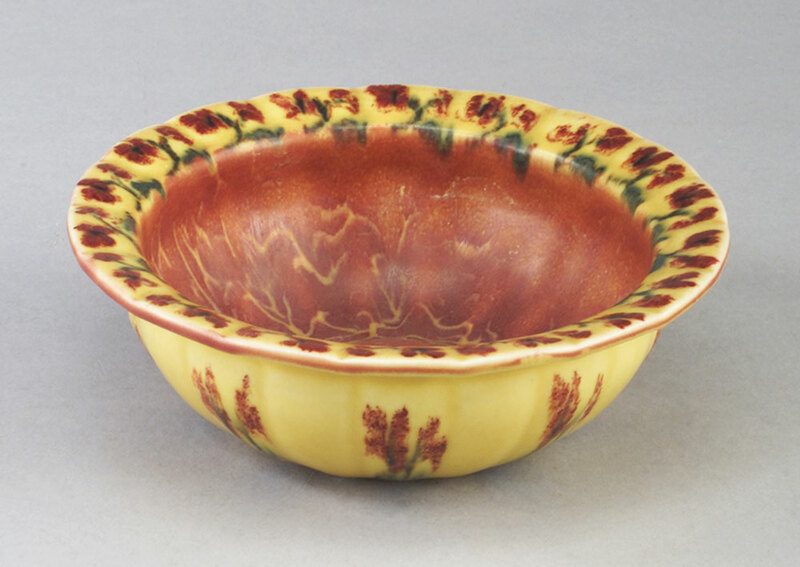 Freeman’s of Philadelphia, PA held its English & Continental Furniture & Decorative Arts sale on October 7, 2014. 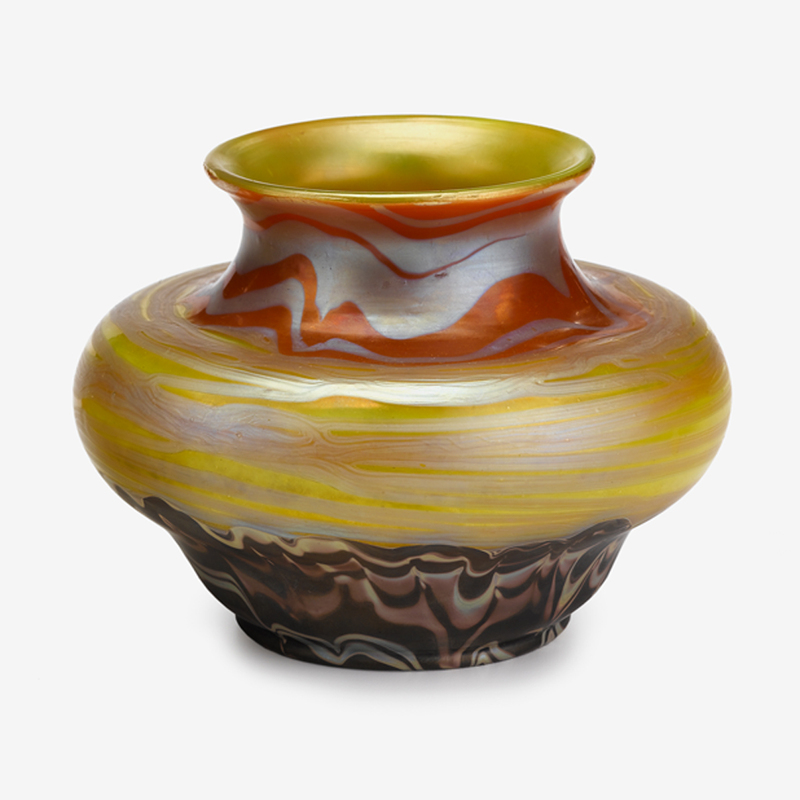 Included in the sale was a section entitled 20th Century Design including Fine Daum, Gallé & Loetz Glass, fresh from estates, with very conservative estimates and reserves. That’s always a combination that bodes well. 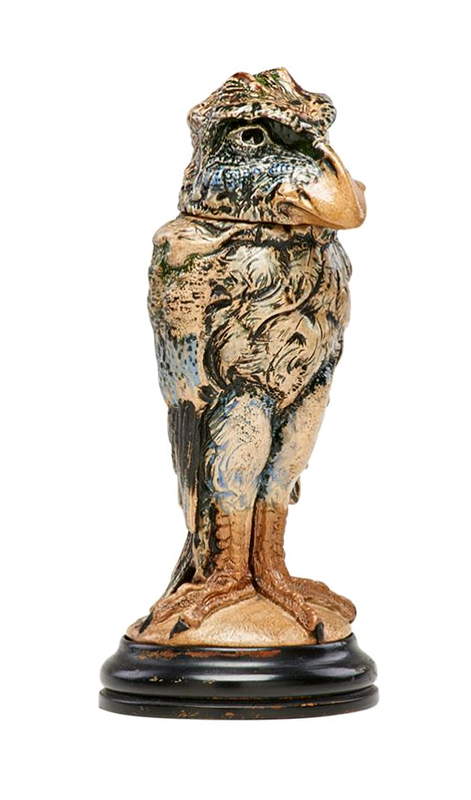 Top lot of this group was a Daum Blackbird & Frog vase. It flew past its pre-sale estimate of $2,000 – $4,000 to realize $16,250 (buyer’s premium included). 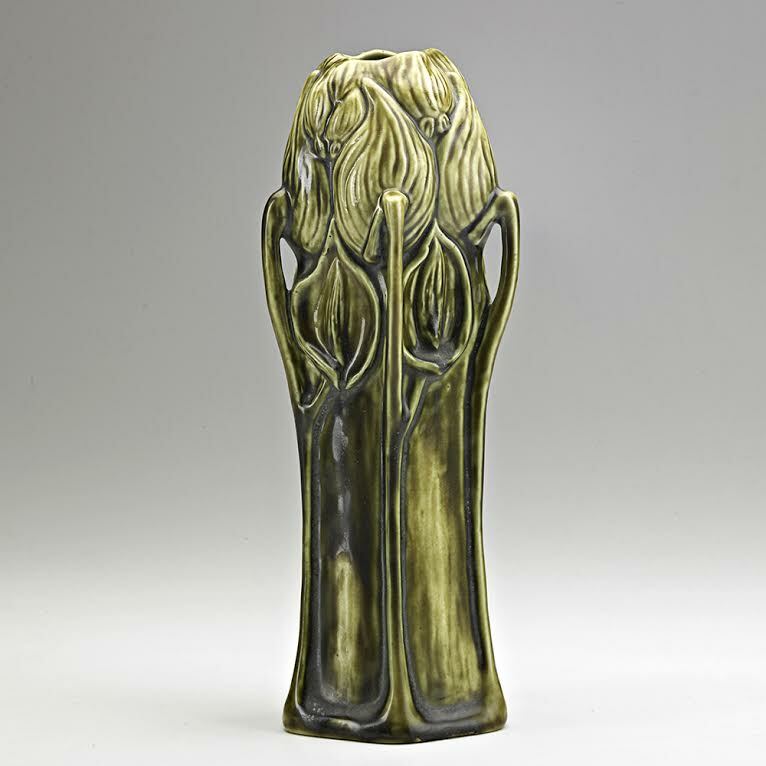 While that may seem like a good result, the identical vase sold at Bonham’s New York in December, 2012 for $43,750 (against a pre-sale estimate of $15,000 – $20,000). What explains the difference? In my opinion, two people got carried away at Bonham’s in 2012. 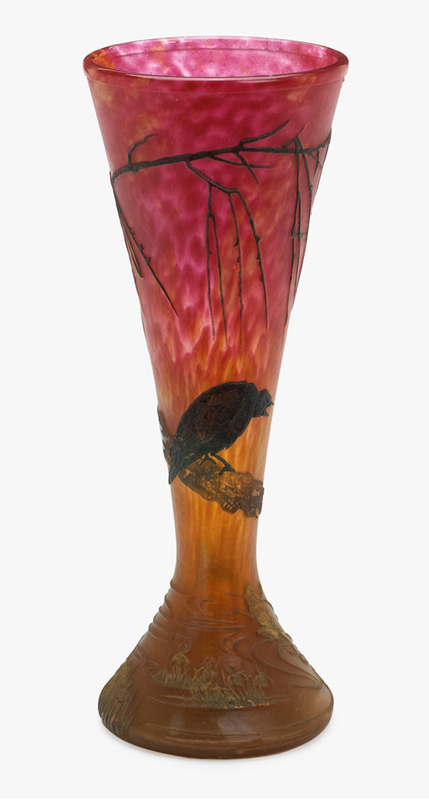 $43,750 for this vase just sounds over the top. 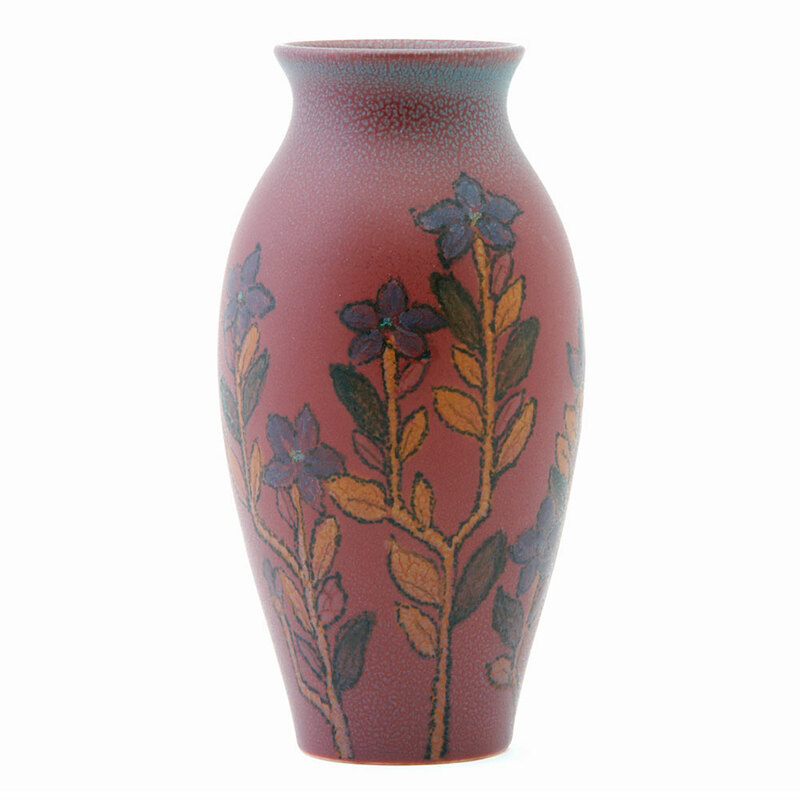 Lot # 460 was a small (4″ tall), but rare, Loetz Black Bottom vase, estimated to sell for $1,500 – $2,500. I tried to buy it, but couldn’t when the price went into retail territory. The final result was $8,960 (buyer’s premium included). 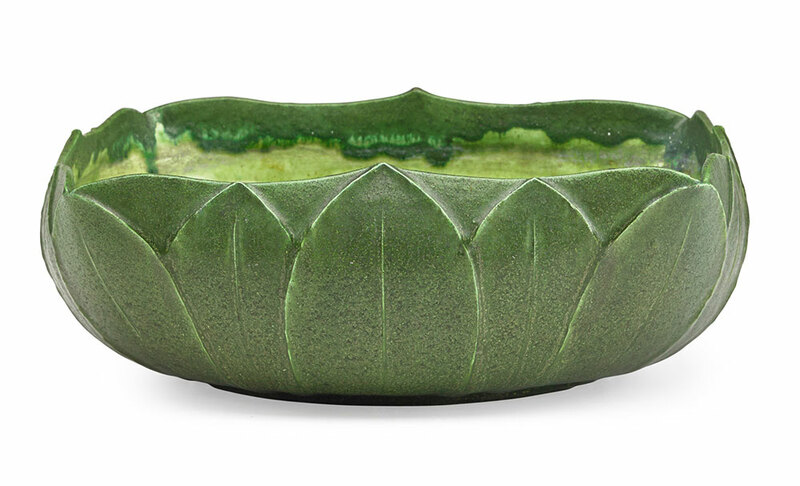 Doyle New York held its Belle Epoque sale on September 23, 2014. 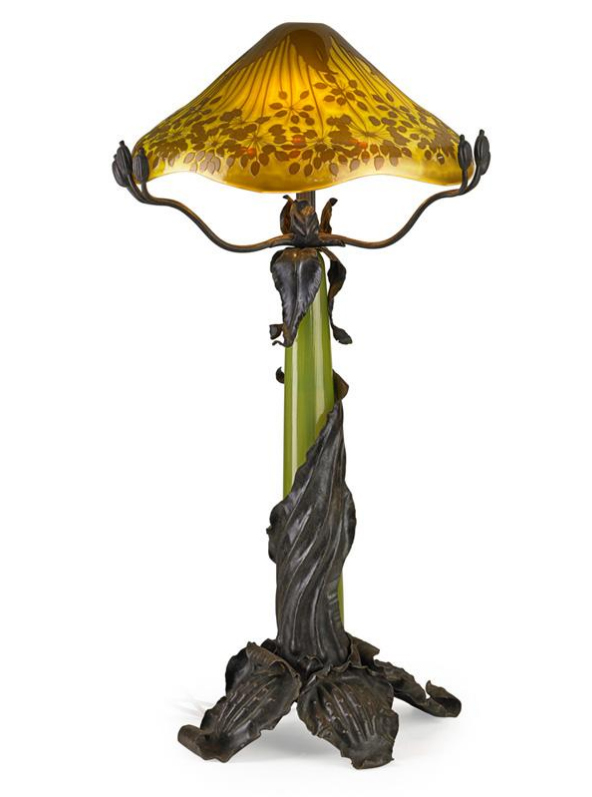 Included in the sale were several Tiffany Studios lamps, which performed well as a group. 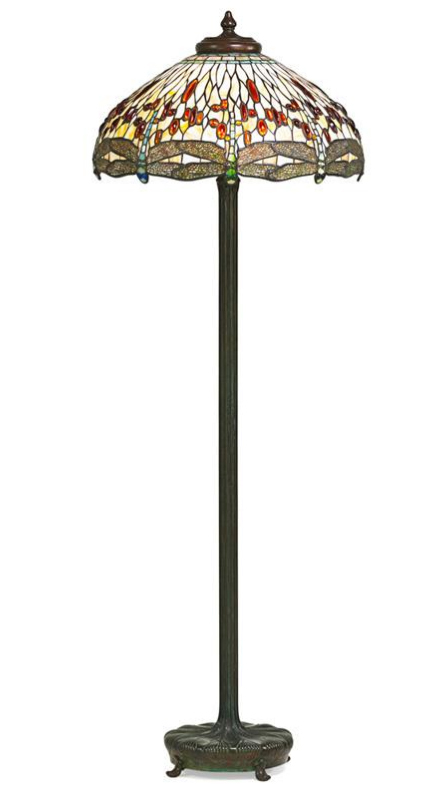 Top lot of the sale was a Tiffany Studios 20″ diameter Dragonfly table lamp, deaccessioned by the Boston Museum of Fine Arts. With impeccable provenance, and a beautiful shade, the lamp did not disappoint. Selling as lot #533, it realized $87,500 (including buyer’s premium), against a pre-sale estimate of $50,000-$70,000. While the result for lot #533 could have easily been predicted, the result for lot #525 was completely unexpected. 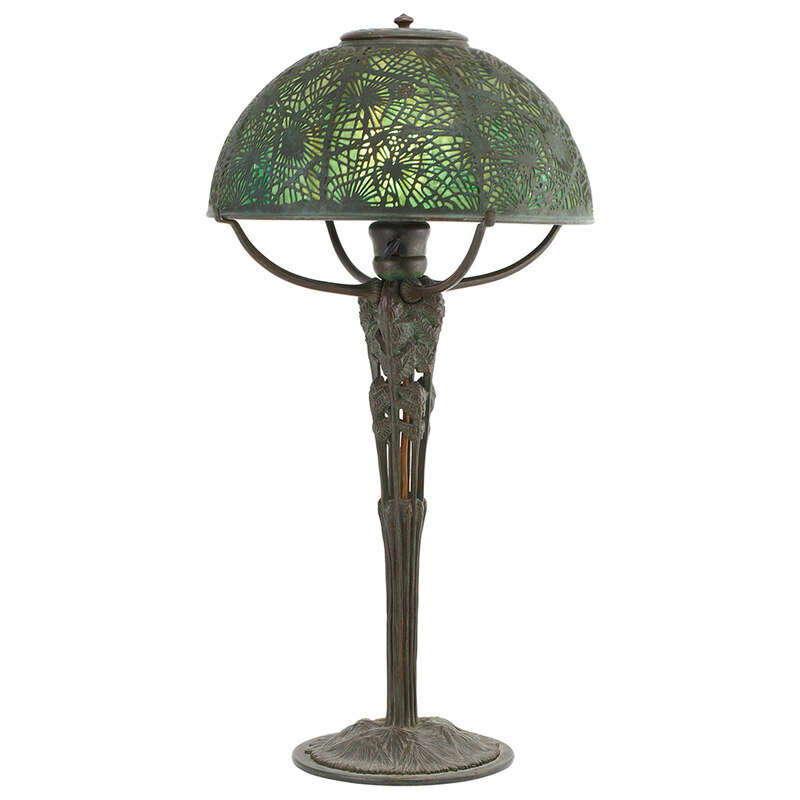 It was a small Tiffany Studios table lamp with a rare Fern base and a 10″ diameter Pine Needle shade, totally damaged. 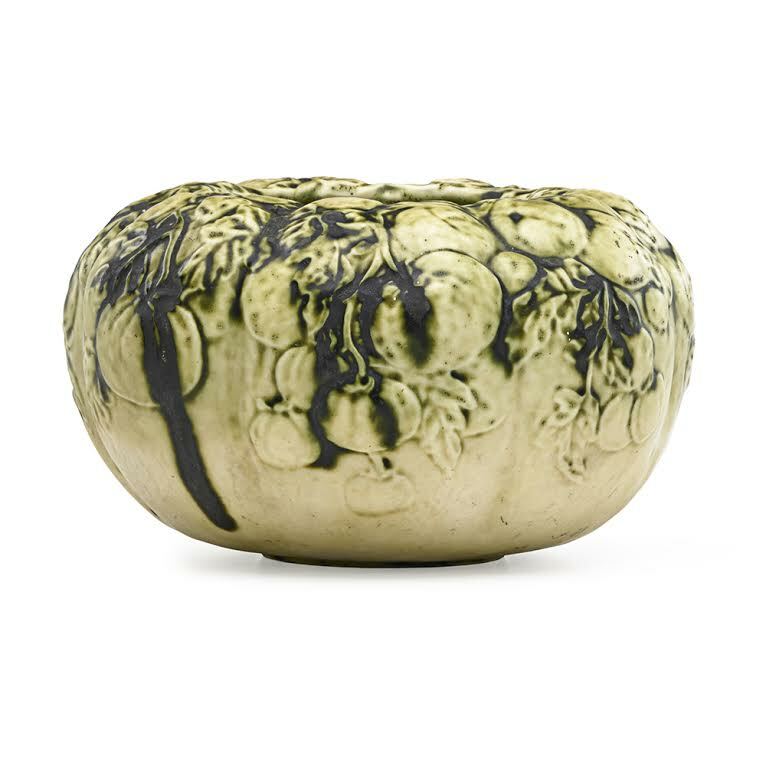 It was expected to sell in the $1,200-$1,800 range, but sold for $31,250 — about 14 times the high estimate. So what was the deal? I spoke to the successful bidder, a collector/dealer, who answered, “When was the last time you saw this base for sale?” It was very rare and he was determined to buy it, no matter what. I imagine he’ll replace the shade with a top-notch Favrile glass shade. 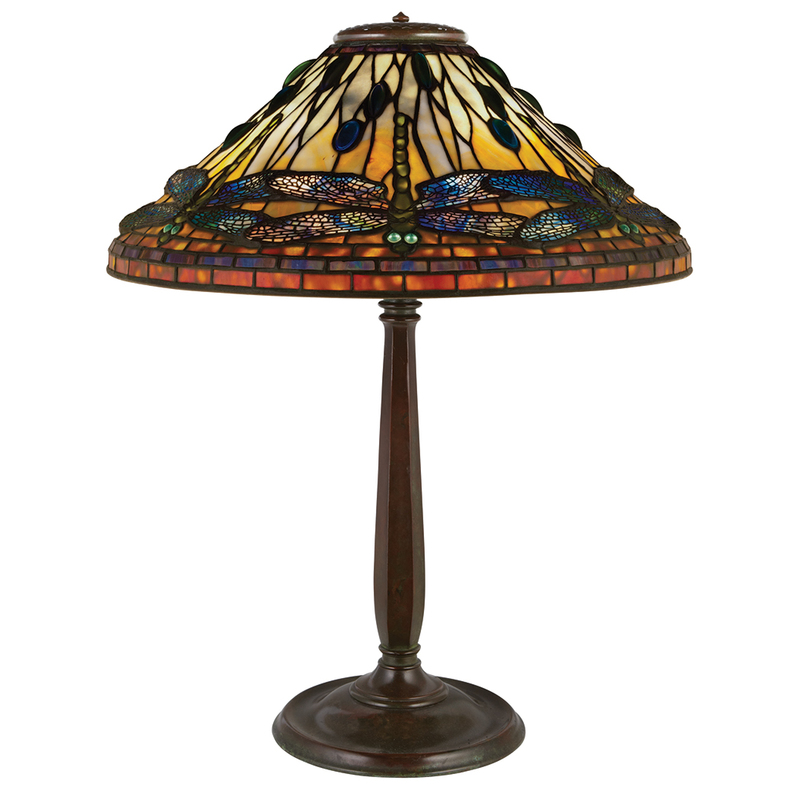 For the rest of the Tiffany lamps and the complete results of the sale, first click here and then choose the September 23, 2014 Belle Epoque sale from the drop-down menu. Cottone’s held their Fine Art & Antique auction this past weekend, September 26-27, 2014, with some good results. Top lot of the sale was a Tiffany Studios memorial window, Angel of Resurrection from the Church of the Redeemer in upstate Newark, NY. It exceeded its high estimate of $60,000 to realize $71,300, including buyer’s premium. 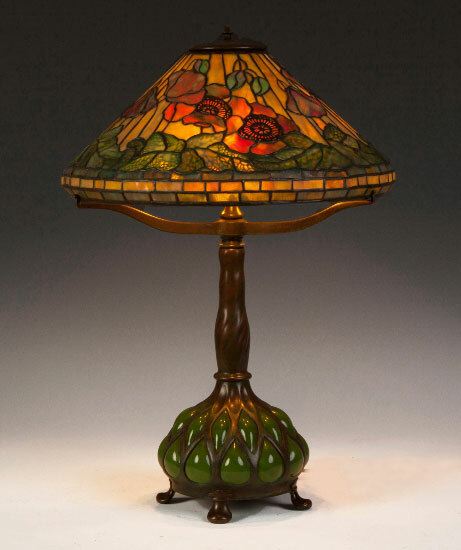 The second highest lot of the sale was another Tiffany Studios item – a 17″ diameter Poppy table lamp. Fresh to the market, the estimate seemed fair, $60,000-$80,000, especially with an important blownout base. To my surprise, it sold for the low estimate of $60,000, plus buyer’s premium ($69,000). Sounded like a deal to me. Martin Brothers birds continued on a decade’s-long flight up. A 10″ bird with lots of character (and some damage) soared past its pre-sale estimate of $7,000-$10,000 to realize $60,950. There were bargains to be had, but unfortunately I was asleep at the switch. I was so preoccupied with the antique show this past weekend that the auction totally slipped my mind. Too bad, because I could have bought some fine items at reasonable prices. For the complete results of the sale, click here.